The Coach Wood Invitational has been/and is one of the highest caliber of competition for meets hosted in Georgia for many years now. I miss the old Gainesville College course, but time marches on as the campus has continued to expand.. The meet this Saturday, found an old familiar friend at McIntosh Nature Preserve on the banks of the Chattahoochee River, surely bringing back many memories for tenured coaches, including Lakeside DeKalb's Joe Thorne's 14:40 performance around the turn of the 21st century.. Limited to less than 60 teams, over 2650 runners crossed the mats Saturday, with the majority of them recording personal bests on the grassy pancake. Over 100 MileSplit 2nd team Silver Elite performances were achieved as well. 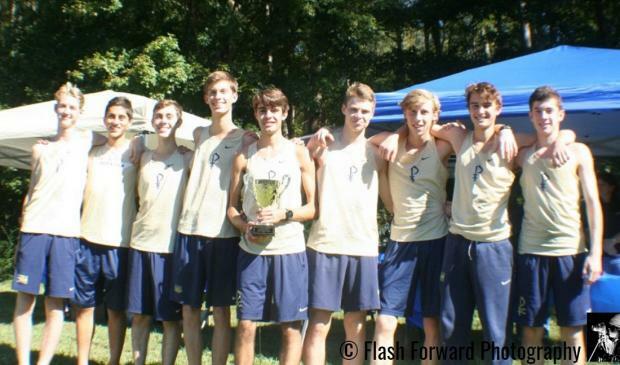 One great thing about the Coach Wood Invite, is most teams run at full strength, which really makes an impact on the Weekly by Class and All Class Team Rankings. Huntsville AL crossed the state line, and like the Bama' Crimson Tide football team, put a whipping on the GA squads, with a 72 point victory margin over top GA squad St. Pius X. Scottsboro AL HS got in on the act taking 3rd 8 points behind the Golden Lions. 7A South Forsyth was 4th and should retain their #1 rank in 7A. Marist didn't kill it like they did at Great American (not sure if someone dnr) but still ran well enough for 5th. 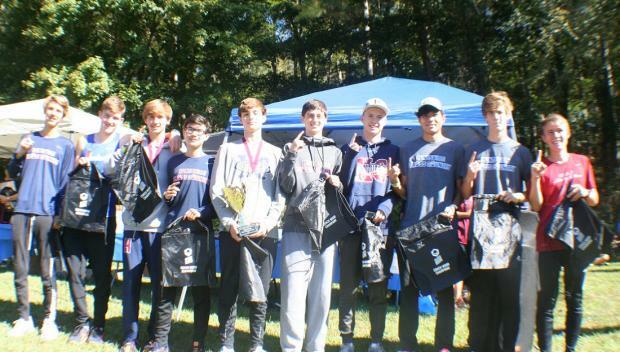 3A Westminster ran great (never discount the Cats') far outdistancing Lovett and North Hall and made themselves the boys team to beat in 3A. Jack Filan of Cambridge is definitely in 'the Zone' winning his 2nd big meet in a row clocking a 15:16. Leif Andersen of Marist had another great outing for the War Eagles placing 3rd in 15:25. 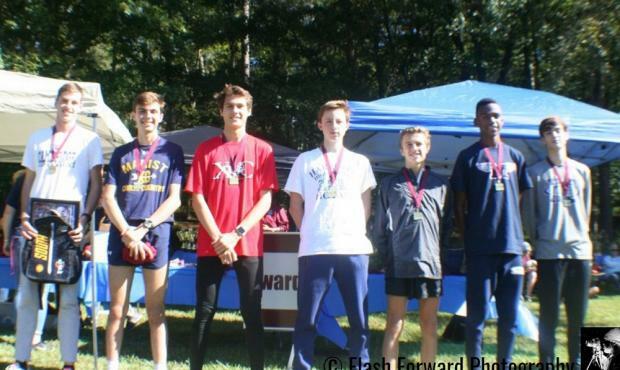 Calan Gizelbach of Forsyth Central had a srong race a step back in 15:25 and change.. Sully Shelton of Harrison HS (a soph) had a great race taking 6th posting a 15:35, Justin Wachtel of Mary Persons mixed it up with the 'big boys' going 15:36 for 7th, and fellow soph Kamari Miller from Marietta HS was 8th at 15:37. That's a heckuva' lead pack at McIntosh Nature Preserve in the Boys Championship race! 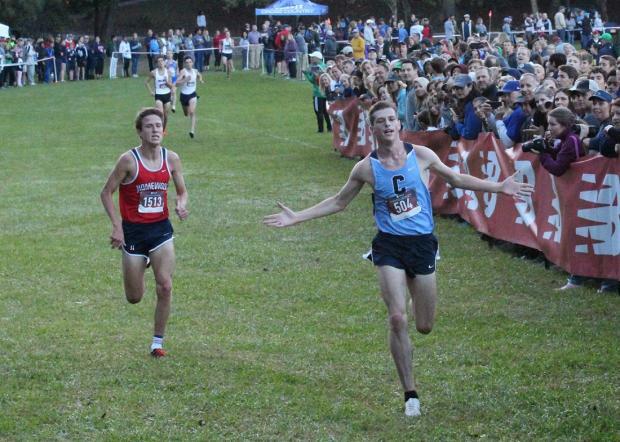 Jack Filan of Cambridge takes his 2nd win in a row.. careful, don't celebrate too early and drop the ball before crossing the line like the UGA Dawgs football team.. Will Stone of Homewood tries to run Filan down..
St. Pius X had a strong race taking runnerup honors as a team. 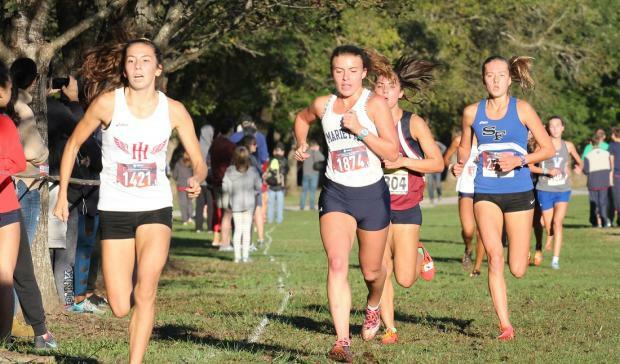 What did we learn from the Girls Championship race? 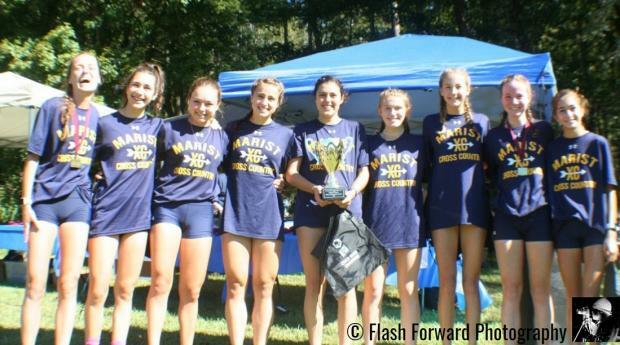 Maybe, that GA has 3 NXN Regional contenders in Marist, Marietta and South Forsyth as only 23 points separated these 3 squads. I don't know if they all ran full strength (but I'm sure our Rankers will) Marist's girls' program is relentless, fast and deep. It now seems to begin for the War Eagles with the MS program, as their MS squad won another state title down in Cochran. 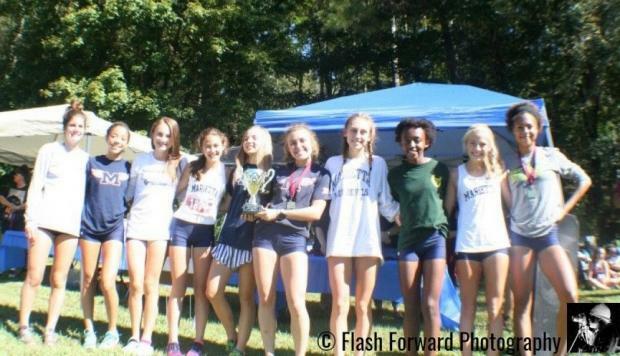 Their JV squad was dominant as well at Coach Wood in that race with runners in the 20's.. Marietta's girls program has taken over the spotlight from their Elite Boys squads they produced the past few seasons. 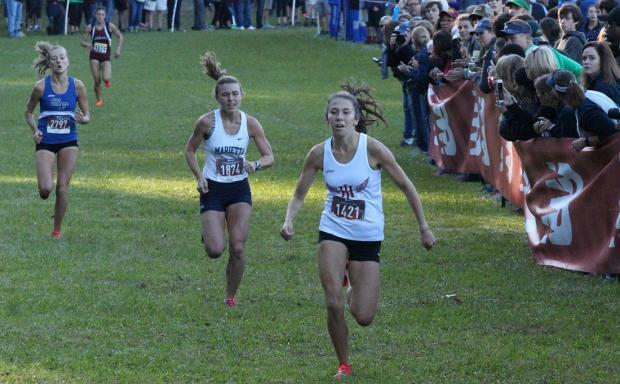 South Forsyth is on a collision course with Marietta HS at the state championships in the 7A race on Friday 11/2. 5A Woodland and 6A Cambridge ran very well at Coach Wood.. There have been whispers going around that Jackie Addy of Holy Innocents was going to bring it in October, and it has proven true. Addy won Darlington and followed that by taking the Overall win at Coach Wood going 17:49. The A Private race is going to be special at State, with perhaps the fastest 5-6 girls as a group in recent history. Ellie Hall of Marietta looked very fit, a couple seconds back at 17:51 making her one of the favorites to contend at 7A State. Madelynne Cadeau of South Forsyth was right in it till the end taking 3rd at 17:52. 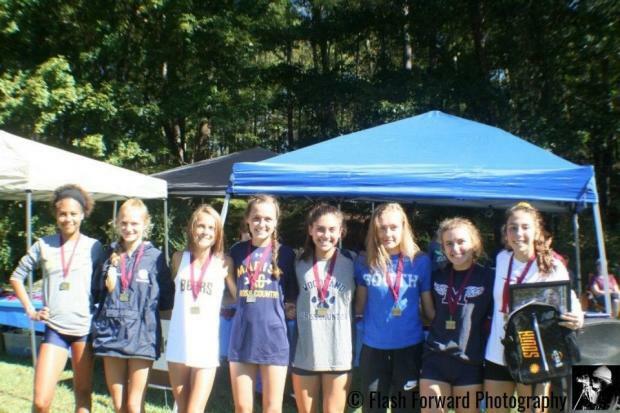 McKenna Trapheagen of Woodland HS went sub 17:59 making her a contender to win 5A State in less than 3 weeks.. Kathleen Maley led the way for Marist's team win placing 5th posting a 18:21. L-R, Jackie Addy of Holy Innocents, Ellie Hall of Marietta, McKenna Trapheagen of Woodland and Madelynn Cadeau of South Forsyth joust for position in the lead pack..
Addy sprints hard to the finish line for the Overall win ahead of Hall and Cadeau. 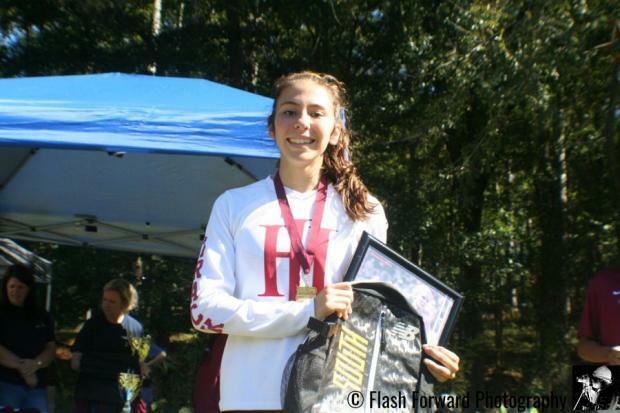 Jackie Addy of Holy Innocents is hitting her stride taking the wins at Darlington and Coach Wood. Marist Girls celebrate yet another win. Someone needs to expand that school trophy case..
Marietta's Lady Blue Devils were a close 2nd behind Marist.